Cullasaja Falls - Cullasaja Falls is located just off the Highlands Road. The waterfall is located on the Cullasaja River in the Nantahala National Forest. Cullasaja comes from a Cherokee word meaning "honey locust place." The falls is the last major waterfall on the Cullasaja river. The falls is a long cascade over the course of 0.2 miles. Google Earth gives a height of 137 ft. It is easy to catch a glimpse of the Cullasaja Falls as you drive by; however, getting a better view of the falls is not easy. There is only one small pull-off near the falls. Dry Falls - Walk underneath the 75 ft. falls. Dry Falls, also known as Upper Cullasaja Falls, a 65-foot waterfall. Dry Falls is part of a series of waterfalls on a 8.7-mile stretch of the river that eventually ends with Cullasaja Falls. Dry Falls flows over an overhanging bluff that allows visitors to walk up under the falls and remain relatively dry when the waterflow is low, hence its name. Bridal Veil Falls - Bridal Veil Falls is a 45-foot waterfall. It has the distinction of being the only waterfall in the state that one can drive a vehicle under. Bridal Veil Falls flows over an overhanging bluff that allows visitors to walk behind the falls and remain dry when the waterflow is low. During periods of drought, the stream may nearly dry up, though visitors will get wet if the waterflow is moderate or high. Highway 64 originally used the curve of roadway behind the falls exclusively so that all traffic went behind them; however, this caused problems with icing of the roadway during freezing weather, and Hwy. 64 has been re-routed around the front of the falls since. In 2003, a massive boulder slid off the left side of the falls, blocking that side of the drive-under completely. However, in July 2007, that boulder was removed by a local developer. Glen Falls - Glen Falls is a wonderful place to visit if you enjoy short distant hiking. Glen Falls is just off of Hwy 64 in Highlands, NC. To get to Glen Falls take a left on Hwy 106 outside of Highlands, go about 1.7 miles and look for the sign to Glen Falls Scenic area on the left. The gravel road to the Falls (SR 1618) veers off immediately to the right after you take the left, so go slow. The road dead ends into the parking area. In a short distance from the parking area, the trail brings you to a nice view across the mountains. Continue down the trail and to a railing on the right for this view looking down the waterfall. The trail is about 3/4 mile and not bad if your in OK shape. Whitewater Falls - At 411 ft., the highest falls in Eastern America. From Cashiers, take U.S. 64 east, 10 mi. to "Whitewater Road." Falls are located 10 mi. south on Whitewater Rd., near the NC-SC state line. Drift, Horsepasture and Rainbow Falls are also accessible from Whitewater Rd. Whitewater Falls can also be reached from N.C. 107, south of Cashiers. Rainbow Falls - From Cashiers, take U.S. 64 to N.C. 281 South. The trail to the falls is two miles from this intersection. 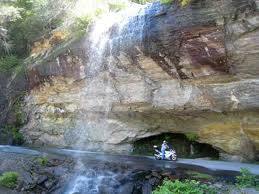 Toxaway Falls - The falls can be seen from your car as you cross the Toxaway River on U.S. 64 East near Rosman. Sliding Rock - This natural waterslide is a favorite of many people. Just jump in the water at the top of the falls and slide down the rock face to the bottom. 11,000 gallons of 50 to 60 degree water rushes down the rock every minute. Take 276 North from Brevard. Looking Glass Falls - Take 276 North from Brevard. Falls is approximately 4 miles north of Ranger Station.Parking area is well marked. Short walk to falls. Big Laurel Falls - Go 9 miles west on U.S. 64. Turn left on West Old Murphy Rd and go 7 miles to Standing Indian Campground (5 miles past Back Country Information Center). Trail runs along an old railroad grade. After passing over bridge, it splits; right ends at Big Laurel Falls. Mooney Falls - Not too far outside of Franklin, located in the beautiful Nantahala National Forest, near Standing Indian Campground one can enjoy the beauty of Mooney Falls. Mooney Falls is about 20' and there is a small swimming hole near the bottom of the falls. To get to Mooney Falls, take Hwy 64W to left on West Old Murphy Rd. to left into Standing Indian Campground, the road will turn from pavement to gravel. The hike to the waterfall is an easy .5 mile hike along Big Laurel Branch. A short distance from the trailhead, turn right at the fork in the trail and follow the creek up to the fall. Remember, it can be cool up in the higher elevations so don't forget a light sweater or jacket. Indian Creek Falls - From Bryson City, take "Deep Creek Rd." north 3 mi. to Deep Creek Campground in the Great Smoky Mountains National Park. One-mile hike to falls is classified as "easy". Height 60 ft.
Juney Whank Falls -From the Deep Creek trailhead parking area, follow the well-marked trail 1/4 mile uphill to Juney Whank Falls. The roar of the falls can be heard even before you reach it. An eighty-foot cascade of water starts above you and runs under a log footbridge with handrails, and meets up with Deep Creek at the bottom of the trail. Indian Creek Falls — Continuing along the Deep Creek trail for approximately one mile, the trail winds up a slight grade to where Indian Creek spills into Deep Creek. Follow the Indian Creek Trail to the right 200 feet uphill to Indian Creek Falls, a high-spirited waterfall that noisily plunges 25 feet to the pool below. A small spur trail leads to the bottom of the falls. Mingo Falls — Arguably the most stunning cascade in the region is Mingo Falls on the Cherokee Indian Reservation. From the Saunooke Village shopping area in downtown Cherokee, drive north on Big Cove Road approximately 5 miles (past the KOA Campground) to the Mingo Falls parking lot. The walk from the parking lot is short (just a hundred yards) but very steep. Soco Falls — About 11 miles east of Cherokee on US 19 towards Maggie Valley you'll find Soco Falls on your right. There's a small unmarked pull-off and a short walk leads you to a viewing platform for Soco Falls and another smaller falls. Coming from Maggie Valley, it's 1.5 miles west from the Blue Ridge Parkway and will be on your left. Two other Swain County waterfalls are in the Great Smoky Mountains National Park — Little Creek Falls is on the section of the Deeplow Gap Trail north of the Cooper Creek trail and south of the Thomas Divide Trail. Twentymile Cascade is a small waterfall at the southwestern corner of the Park. From Fontana Village Resort, drive six miles west on Highway 28 to the Twentymile Ranger Station where the Twentymile Trail begins. Hike a half-mile to the first bridge, bear right and continue another 100 yards to the narrow spur trail, which leads off to the right and to the Twentymile Cascade. Deeper into the National Park's back country are two more waterfalls seen only by back country hikers — the Forney Creek Cascade just south of Clingmans Dome, and the Hazel Creek Cascade, about two miles south of Silers Bald.